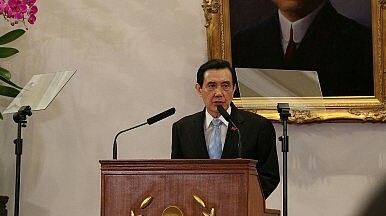 Ma Ying-jeou at a press conference before his meeting with Xi Jinping. Ma Ying-jeou may be the last Taiwanese president to embrace a “one China” mentality. Mr. Xi Jinping just met Mr. Ma Ying-jeou in Singapore, an event many media members have praised as historic. On one level, this is no doubt true; it is the first meeting of the top leaders of Taiwan and China since the start of the Chinese Civil War in 1945. However, the meeting had more symbolic effects than actual results. It was not a meeting to open a better relationship between the two sides. Actually, many have predicted that cross-strait relations will turn hostile again after Taiwan’s presidential election in January 2016, when the more independence-minded Democratic Progressive Party will likely come back to power. This was also not a meeting that will define the future trend of bilateral relationship. While Xi is becoming more and more powerful and will decide China’s future direction, Ma, on the other hand, no longer represents Taiwan’s future orientation. Actually, Taiwan will go in a quite different direction after his departure from office in several months. If this meeting is historic, it is for a different reason: it is a chance to say farewell to Ma, who will most likely be the last president elected in Taiwan who still has a “one-China” mentality. This meeting is a farewell to the old tradition and paradigm of cross-Strait relations. The identity of the Taiwanese people is drifting. Many recent public opinion surveys have indicated that fewer and fewer Taiwanese view themselves as Chinese, and there is a major generation gap. The surveys also indicated that the majority of people under 40 years old consider themselves as only Taiwanese and are pro-independence. The official name of Taiwan is the Republic of China (ROC), a name that hearkens to the past and one indicating that the rivalry between Beijing and Taipei is about who is the rightful government of China. But this mentality will leave office with Ma. While Republic of China will remain the official name of Taiwan and the current one-China constitution will still be kept for the foreseeable future, any attempts to make changes on these in Taiwan will meet fierce reactions from Beijing. However, people’s perceptions and identity have changed. While Ma won’t be the last Kuomintang (KMT) president in Taiwan’s democracy, the chance that Taiwanese voters will choose a candidate with a one-China mentality and pro-unification orientation will become smaller and smaller in the future. Education and social narratives have played a powerful role in recent decades in shifting Taiwan’s identity. The reason Ma and his party have become a lame duck is because they have become out of touch, creating a major perception gap between the KMT and the younger generations. For Xi Jinping, this meeting was the time to say farewell to the past. He needs to prepare for facing a new Taiwan. Even the future of the KMT will be quite different after Ma’s departure. In fact, the KMT has already been experiencing a major transformation and becoming more localized, evolving from the one-China doctrine to a more inward-focused party. A good example is found in the campaign slogan of the KMT’s 2016 presidential candidate Eric Chu: “One Taiwan: Taiwan is Power.” In 2014, Chu replaced Ma as the chairman of the KMT after this ruling party suffered a humiliating defeat in local elections. There is no longer a market for the one-China and unification narratives in Taiwan. Without realizing this reality, Beijing will surely make mistakes in its future reactions with Taiwan. While the identity of Taiwan is changing, there is still little chance that Taiwan will gain independence from the mainland. Actually, with China’s rising power, Taiwan’s options for such a move in the geopolitical game are becoming more and more limited. Economically Taiwan will be marginalized. Unfortunately globalization spells as China-ization for Taiwan. The emergence of the new Taiwanese identity can also be seen as a local resistance to the development of China-ization. As Taiwan has been experiencing an identity crisis there has been a lack of consensus and high levels of political partisanship. This has all greatly reduced Taiwan’s future competitiveness, making its future outlook quite bleak. This is probably the sad destiny of the island. For Ma, this meeting was a farewell to his presidency. He may consider the stability of cross-strait relations as his greatest legacy, so this is a meeting to celebrate his historic legacy. For Xi, this is in fact a meeting to say farewell to the one-China KMT and a meeting to prepare for working with a new Taiwan. Even though Xi has the power to keep greater restrictions on Taiwan, the major identity transformation will make Taiwan a definite new trouble for Beijing. When rising power meets changing identity, there’s a different game to play. Dr. Zheng Wang is the Director of the Center for Peace and Conflict Studies (CPCS) at the School of Diplomacy and International Relations of Seton Hall University in New Jersey. He is a Carnegie Fellow at New America and a Global Fellow at the Kissinger Institute on China and the United States of the Woodrow Wilson International Center for Scholars.